Real Estate Agency in Idaho Real Estate. What and why you should know BEFORE you talk to a Boise Realtor. ®®®Many potential buyers and sellers start talking to Real Estate agents and give them too much information too soon! 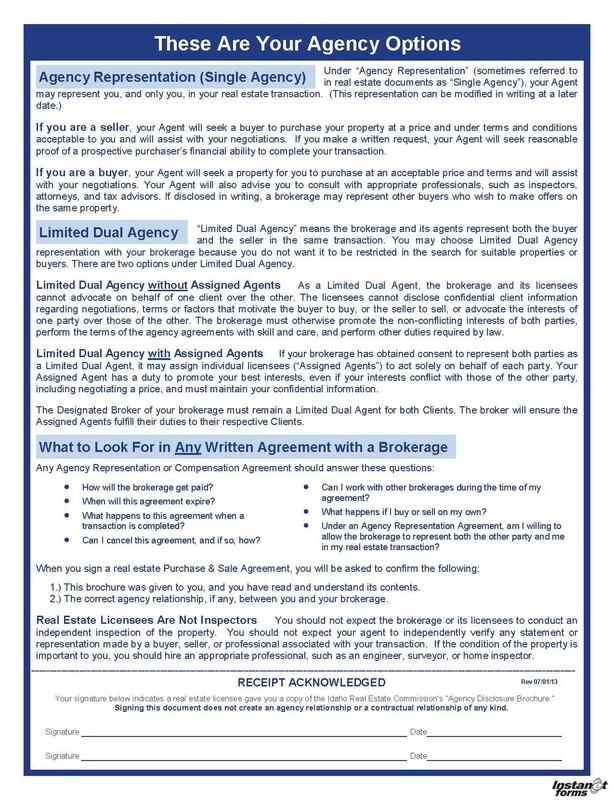 Understanding “Agency” is very important regardless of whether you sign an agency contract or not. It is so important that it is the Law in Idaho that Real Estate agents give you the brochure below. That is why we urge you to read this and if fact, click on the link below for the PDF and print it. First time home buyers and sellers, and even those with experience often believe many myths. When buyers meet with Realtors® who bring up agency they sometimes think the Realtor® is being pushy and trying to get them to sign up with them. It is true that when you do sign an agency agreement there is a commitment both ways. Usually there will be a time period that you agree that you will use that agent to purchase a home. But the truth is, without a written agreement you the agent has no binding duty to act as your statutory or fiduciary agent. 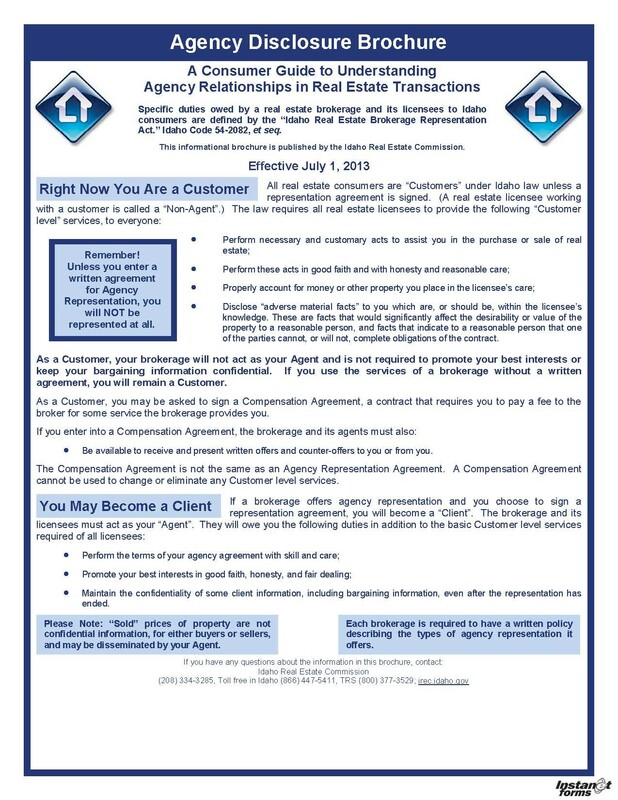 In fact if you are talking to a listing agent, he or she already has an agency agreement with the Seller of that particular house and he or she has a legal DUTY to get the best deal for the seller, to hold all of the seller’s information confidentially and DISCLOSE any potential buyer’s information unless that buyer is also an “client” of the agent, in an agency relationship. We want all of our potential clients to KNOW all of this before they disclose what they shouldn’t. All Realtors® are bound to treat non clients and clients alike honestly. But they must go above and beyond when there is a written agency agreement. They must hold your best interest at the highest level. They must hold all of your information confidentially. This brochure also explains dual agency. You should understand it before you give information about your lending, how much you would pay for a particular home or much of anything at all. If you have any question about any of this please click on the agents tab above and call one of us and have us explain to you anything that you may not understand. Whether buying or selling you need to understand Real Estate Agency in Idaho.